FILE - Students hold a HEPA filter as they prepare to put it on a fan at a workshop to learn how to make a DIY air purifier at a college in Beijing. 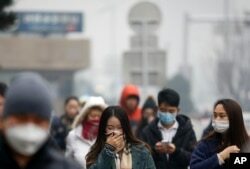 The intense levels of smog in China's capital city this week forced the government to issue Beijing's first-ever "red alert," closing schools and offices and sending residents fleeing indoors to escape the choking pollution. The withering fumes led some parents to send their children to school, despite the “red alert” that ordered them closed. “I sent my daughter to the kindergarten because it has strong air purifiers. She would be safer in school as I don't have it at home,” said Fang Yang, mother of a 5-year-old girl. With many city-dwellers now focused on the quality of their air at home, there is a growing movement for do-it-yourself air purifiers. Supporters say they can be made for a fraction of the cost of name brands sold in shopping malls. “Clean air should be a human right, not a luxury product,” said Aily Zhang, an executive at Smart Clean Air, who gives public lectures and demonstrations to help people make their own devices. FILE - A woman uses a scarf and others wear masks to cover their face from pollutants as they walk along a street on a polluted day in Beijing. Air purifiers, respirators, and anti-pollution masks are in huge demand. But for many Chinese, the cost of name-brand air filters is out of reach. Brand name air purifiers in recent years have sold for between $580 to $2000. But with growing concerns over air quality, there are now cheaper brands for less than $165. That's still too expensive for many Chinese, who are turning to people like Aily Zhang for advice. She said that an effective air purifier can be put together for as little as $34. A better purifier, which has a stronger filter, would cost about $80. Both the do-it-yourself units and the brand name machines use the same glass-fiber filter called a HEPA or high efficiency particulate air filter. The difference is that those who make their own filters essential rig-up the filter with a household fan, which forces polluted air through the filter, trapping the microscopic particles that comprise the majority of the pollution. “The basic DIY air purifiers are almost as effective as the branded ones. They clear 92 percent of all particular matter greater than 0.3 microns or below 0.3 microns,” said Zhang, executive with Smart Air Filters, which sells components of air purifiers. There are no official industry standards on air filters, but anecdotal tests by various groups have found that the homemade devices are effective at cleaning the air.